Kekeha Solis is an Associate Professor of Hawaiian at Kawaihuelani Center for Hawaiian Language. His dedication and aloha for his students is very apparent in his teaching style. His research covers language and culture revitalization and worldview utilizing traditional and contemporary sayings. He teaches an array of introductory as well as upper division Hawaiian Language courses. 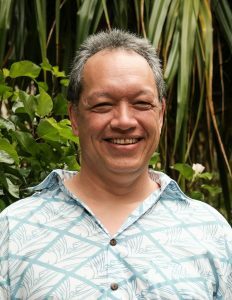 Kekeha is famous among his students for his ‘ōlelo noʻeau course in which students learn the wit and intelligence kūpuna had when using Hawaiian proverbs. His other popular coursework includes facilitating student voice-over projects using popular films to engage Hawaiian language learners.